Cherupayar Cabbage Thoran is a very tasty combination thoran. It is a great side dish for rice. Loaded with health benefits, cherupayar does wonders to your diet. I try all possible dishes with Cherupayar (Mung Beans/ Moong Dal) because of its health benefits and also because it is our Kudumba curry (a family favorite known as “cheroos”). 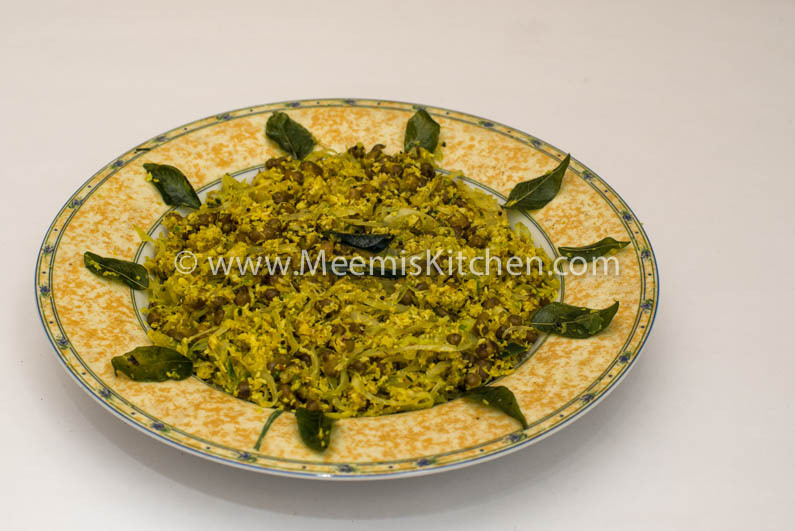 Sprouted mung thoran, Cherupayar ularthiyathu, cherupayar Vazhakoombu thoran, Vazhakka Cherupayar thoran– we have countless dishes with cheroos or Mung Beans. Cabbage and Cherupayar has amazing health benefits as described below and is a healthy side dish for rice. Mung Beans contains many nutrients like folate, thiamin and iron and Cabbage has folate and other essential nutrients, hence, this dish is good for pregnant ladies. The combination is tasty and healthy so include this in your diet. You may also like my other cabbage combinations like Cabbage Irachi thoran, Cabbage Fish curry in coconut milk etc. This Cherupayar Cabbage Thoran is my mom’s style thoran, as I told you, she is always into combinations, she calls it “mixed doubles”. Try my Beans Carrot thoran, Padavalanga carrot thran, Vanpayar Kaya thoran, cabbage Irachi thoran, Kaya achingapayar ularthu etc. which are all wonderful combinations.Together, cabbage and cherupayar has delightful taste and is a must try side dish with your Kerala rice. See below for the amazing health benefits of Mung Beans. Dedicating this recipe to my whole family who are all ardent cherupayar fans. Soak Cherupayar in water for 3 hours. Pressure cook the payar with just enough water to cover payar (no salt). Keep aside. Chop the cabbage into fine strands. Grind coarsely Coconut, chilly, few curry leaves, onion and turmeric. Heat oil in a kadai, pop mustards, then curry leaves and add the cabbage, salt. 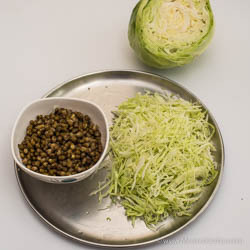 Mix well and cover and cook the cabbage. Once it is cooked, add the cooked Cherupayar and the ground coconut mix. Don’t stir or mix, just cover and cook for another two minutes. Finally mix all together well by folding in. There your healthy thoran is ready to be savored. See the health benefits below. Mung Beans/ Green gram is considered as Vegetarian superfood. It is loaded with vitamins and proteins and is low carb. It protects you from diseases and is good for your skin and hair. It maintains your blood pressure, counteracts the effects of sodium and helps you live a life that is healthy and active. You can substitute onion with small onions, but I think onion tastes better. You can cook 1 cup Cherupayar and keep the half in the fridge for the next day and try a different version. Enjoy your delicious healthy thoran with rice God Bless!